Cervical facet joints are small joints located in pairs on the back/side of your neck whereas thoracic facet joints are in your mid‐back and the lumbar facet joints are in your lower back. These joints provide stability and help guide motion. The facet joints can become painful due to arthritis, a back injury or mechanical stress to the back. The cervical facet joints can cause pain in your head, neck, shoulder or arm whereas the thoracic facet joints can cause pain in your mid‐back, chest and on rare occasion your arm. The lumbar facet joints can cause pain in your lower back, hip buttock or leg. 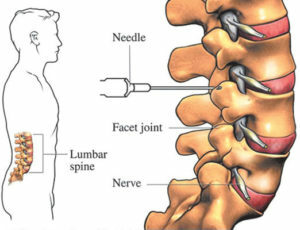 A cervical (neck), thoracic (upper back) or lumbar (lower back) facet joint injection involves injecting a steroid medication, which can anesthetize the facet joints and block the pain. Facet joint injections usually have two goals: to help diagnose the cause and location of pain and to provide pain relief. First, by placing numbing medicine into the joint, the amount of immediate pain relief you experience will help confirm or deny the joint as a source of your pain. That is, if you obtain complete relief of your main pain while the facet joints are numb, then these joints are likely your pain source. Furthermore, time‐release cortisone will be injected into these joints to reduce any presumed inflammation, which can, on many occasions, provide long‐term pain relief.